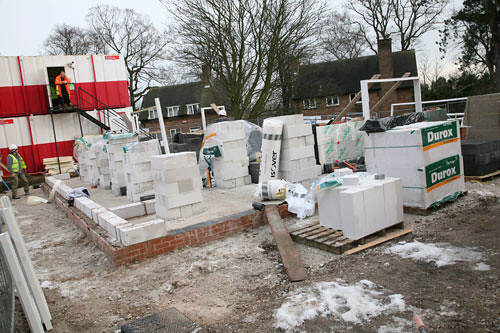 The Tarmac Homes project build is continuing at a pace and to manage the interest generated by the launch of the web site. The project team have scheduled a series of short seminars and site visits to inform interested customers, clients, architects, suppliers and contractors. - We are limited to 16 places per session due to room sizes. - There are no restrictions on the number of people visiting from the same company. - We can arrange group bookings on alternative dates to the ones shown on our website. - The date is changeable. - If unable to attend we do ask that you give as much notice as possible so we can give unused places to other people. - There is no fee to pay. Session times will be 10am and 12.30pm. Other dates are available throughout the year. To book a site visit please complete our online form and we'll confirm your place, along with a location map and health & safety requirements on site (although Personal Protection Equipment is available for visitors on site, we will confirm whether additional PPE is required) . As a brief summary, the following activities are scheduled to take place in each month. This is a guide only and we will confirm what stage of build you are likely to see on the date you visit. Group bookings are also available on request. Please contact us with specific questions.